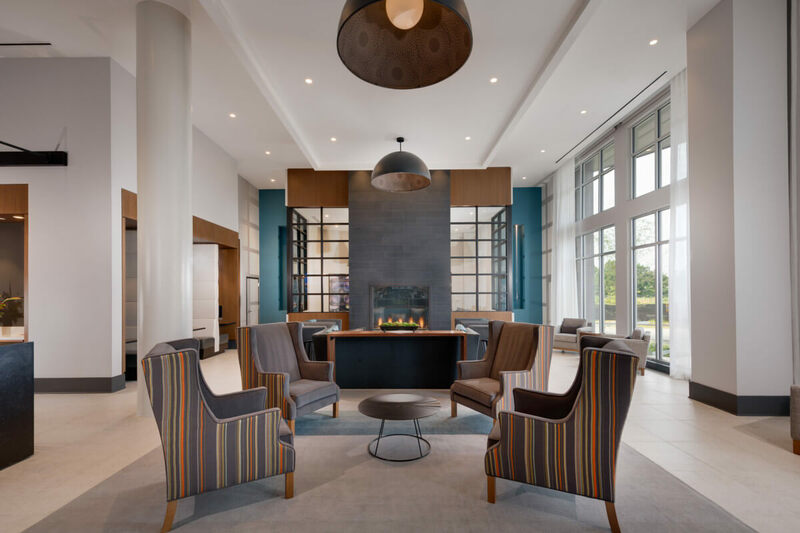 What would your day look like if you spent the entirety of it at The Daley at Shady Grove in Rockville, MD? We have a few ideas. You could start your morning off by walking to the onsite Starbucks for a steamy Latte or Americano. Once you get a little caffeine pumping through your veins, you could hit the the indoor or outdoor fitness and yoga areas. Since you probably worked up a sweat, you can head back home to enjoy your Delta rain shower head and get ready for the day in your double vanity bathroom with quartz countertops. Pick out your outfit in your walk-in closet and grab your fresh load of laundry out of your full-sized in-unit dryer. Whip up a little breakfast in your designer kitchen and pull up a stool to your kitchen island to enjoy the fruits (or bacon) of your labor. Pop back downstairs and utilize the the e-booths to check on your work emails and tackle some internet shopping. When those packages you order come in, rest assured that they are in good hands with our package acceptance service. After you go back home, you realize that your pup needs a little bath. That’s easy, with The Daley at Shady Grove’s pet spa. Spray down and scrub up your furry friend without the mess or hassle at our pet friendly wash stations. Next, head to our on-site soon-to-be nail salon for a fresh manicure or relaxing pedicure to treat yourself for all of that hard pet washing. While you are out of the house, you can stop by our soon-to-be on-site wine shop to grab some vino for your dinner party you are going to throw. When you get back home, your dry cleaning for your dinner party is waiting for you at your door with our valet dry cleaning service. You order in your favorite local Rockville restaurant for you and your friends, and add the wine you grabbed from the onsite shop to pair with all of the yummy eats. Then, you can show off your beautiful Daley at Shady Grove home to all of your friends with good food and drinks in tow. Now, that’s a great way to spend an entire day at The Daley. Make this dream a reality by scheduling a tour to see it all for yourself!